"The tile games are fun and the sound effects are nice, but unlike other tile games it has the bonus of building your own fish tank which is quite entertaining. The fish tank you've created can become your screen saver too!" Create the perfect dream aquarium for all your finned friends. See your pet sims grow and thrive in their happy kingdom. Progress through challenging boards and solve puzzles to earn cash. Use the money to buy eye-candy fish and attractive ornaments. 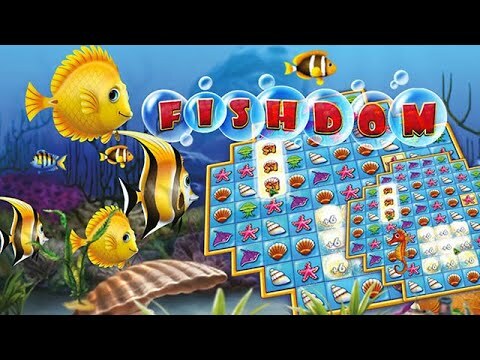 Win awards and upgrade your virtual tank as you perfect your aquarium design skills in Fishdom. This is the best game of this type out there. Challenging, but not impossible. It is a lot of fun! I've had so much fun with this game and my granddaughter took over and had great fun with it too. I'll keep playing 'til the water runs out! I have become addicted to designing and filling up my fish tanks. This is so enjoyable and I would recommend it to everyone who loves fish tanks.